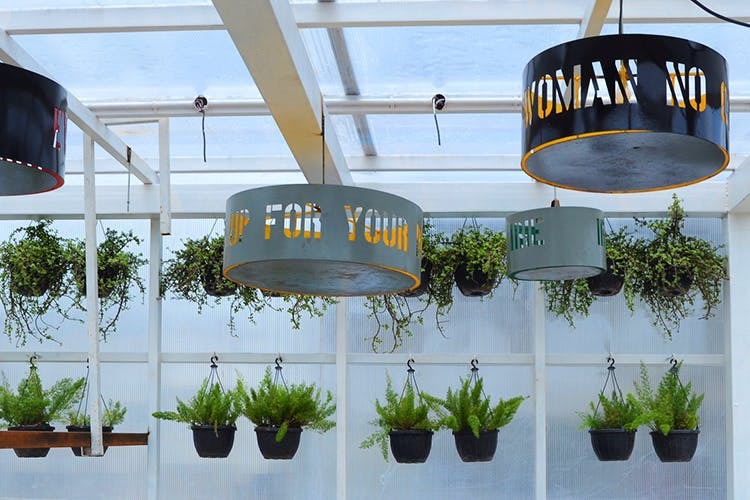 Raasta's Moved Out Of HKV Into Green Park & It Now Has A Gorgeous Terrace! Raasta has packed its bags and moved into its new home in Green Park, leaving the ever-crowded Hauz Khas Village behind. Apart from the location which is a huge plus, since braving the madness of the Village is never fun. The décor has taken a turn from what we’ve grown used to. It feels a bit more refined yet maintains the same vibe that it did in HKV. The best part however, is the rooftop. It’s all white, with lots of greenery and is stunning. Even though it tends to become packed with people, you’re still going to want to head here. Personally, I love pizza. If they do it well, I’m eating it. If I’m hungry, I’m eating it. Even if I don’t hear the greatest things about it, I’m probably still going to try it. That said, I liked the Smoked Chicken Pizza. And baos are to die for: The Keema Kohlapuri and the Jackfruit ones in particular. There’s a lot of stuff on the menu which wasn’t being served at the launch for obvious reasons. I did manage to get a look at the menu and I’m excited to try the Rum Chica Rum Chicken. Made with chicken aged in Rum. In rum! We’re digging the new Raasta. It’s bigger. It’s brighter. And perfect for the cool winter days to come.